If you enjoy the scrumptious aroma of a Candy Cane Latte and you like having silky soft skin, you’re going to love this DIY. Mixing a couple of our favorite wintertime things together (holiday drinks and healthy skin), we’ve come up with a cute, easy-to-make sugar scrub that is sure to add an extra burst of seasonal cheer to your day! This also makes a great gift for friends and family who would enjoy some all-natural, homemade, Candy Cane and Coffee bliss. Pour white sea salt into a medium glass bowl. Pour pink Himalayan salt into a separate medium glass bowl. Blend Candy Cane, Coffee, and Fractionated Coconut Oil together in a small bowl. Mix half of the oil mixture into the white sea salt, and the other half into the pink Himalayan salt; mix well. As you pour the salts into your jar, layer them to make a striped, candy cane look. Optional* add red food coloring to help the Himalayan salt POP and use a festive ribbon to tie a pretty spoon to the jar. Please keep in mind that due to the Peppermint and Peru Balsam essential oils in our Candy Cane Holiday Blend and the use of Coffee, this Candy Cane Latte Salt Scrub recipe is not suitable for children under the age of 10. ** It has been brought to our attention that the graphic says “sugar” instead of “salt” !! We apologize for this mixup; however, if you’d like to replace the salt with sugar, be our guest! That would also make a very lovely scrub! Made this for Christmas gifts this year. Everyone loved the scent. What can you use if you do not have the Candy cane synergy? I cannot wait to make this with everything I ordered today using the 25 days of Christmas codes!! I’ve been really interested in playing with oils lately so with the amazing deal today, I went on a spending spree! This will be my first DIY!! Thanks PT!!! I wonder if you can use Sugar instead of salt? Sugar or Salt either way this sounds like a great gift! Any input on using this months OOTM in substitution would be appreciated (just suggestions on what to pair with it- no spoilers, please), thanks! I can’t wait to try this – it sounds amazing. Great for gifts for the holidays!! Very good recipe! My girls and I love DIY’s and make it a part of our daily count down to Christmas!! I can’t wait to try making this. I see the ingredients are salt though instead of sugar like the title. How would this be made with sugar? Great idea for teacher gifts!! Love it!! I would also like to know if we can sub out one of the salts for sugar, and somehow use real coffee, I don’t have the ego and will never get it in time for Christmas. Ok, I guess I will finally break down and get the coffee EO 😉 Sounds lovely. What a great gift idea for my teenage daughters! Thanks! This scent combo sounds awesome! Recipe title is sugar scrub though it only calls for salt, can we just substitute sugar instead to make it a sugar scrub? I think I will be adding this to my holiday list! thanks for the idea and recipe! My daughter and I are excited to try this! Hopefully we will have time to make it soon! This is interesting. I run a cafe and might try to use this! Thanks! Usually I see Pink Himalayan Sea Salt sold in stores in relatively big pieces. I’m guessing since this is a scrub that this recipe would call for a fine grind instead of those larger chunks? If you only have the big pieces should you grind it down into smaller pieces closer to the sea salt granule size? I actually have everything for this one! I’ll have to give it a try. I made this recipe and loved it so much, that I’m making some as gifts for my friends and family. I cant wait for them to try it as well!!! This sounds wonderful! I don’t have the coffee EO. Can I use coffee infused oil in place of the coconut oil? I think this will make a perfect gift for my sister. This sounds lovely, and i can’t wait to try it and give it to my friends for Christmas. However, can i use other holiday blend instead of candy cane? i only got christmas tree, snow flurries and winter wreath in my stash from last year purchase. thanks in advance! Sounds like a great gift for colleagues. Sounds amazing, going to have to make this over the crafting weekend with my daughter and daughter in law. Pretty sure we will all keep this one for ourselves. This sounds amazing! Hoping to snag the ingredients during the 25 days! Such a great gift idea! I just ordered the candy cane blend and will definitely be trying the recipe out. this looks awesome and will make such great christmas gifts!! I cannot wait to try this recipe..it will be a sure hit as gifts this holiday season. This is an awesome idea! It will make great Christmas gifts. This recipe sounds soooooo good! I love the candy cane synergy! I imagine adding coffee to this just amps up the deliciousness! I also think cocoa would be a great addition to this recipe and the PT website, wink wink! This looks like something my family will love! This sounds so good! I love scrubs and I keep getting tempted by the expensive ones at the store but I have all these ingredients! Peppermint lattes are a favorite of mine and I am so excited to try this out! This looks like an amazing idea. But can I used the Frosted mint instead of candy cane and without the coffee as I don’t have it? Thank you. this sounds delightful!! definitely adding of these oils to my list for 25 days of Christmas! I am so excited to try this!! I bought the Coffee EO, but haven’t really used it much yet! 🙂 I may just make this as Christmas presents for the ladies at work! This sounds lovely!!! I made the regular candy cane sugar scrub from the 2015 blog post and it was great. 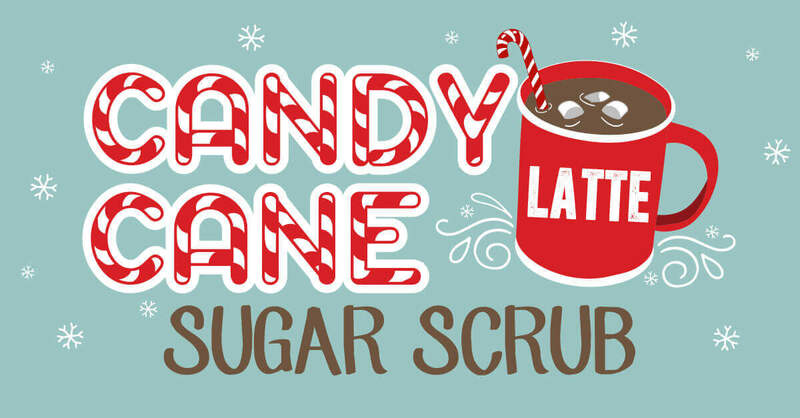 Im sure a candy cane latte scrub will be a hit with my coffee loving family. I may make a batch with sugar and a batch with salt. Thanks for the great recipes! Can this be made without coffee? I’m not a fan of the smell of coffee, but I want to make this for some awesome gifts! Yes it can! 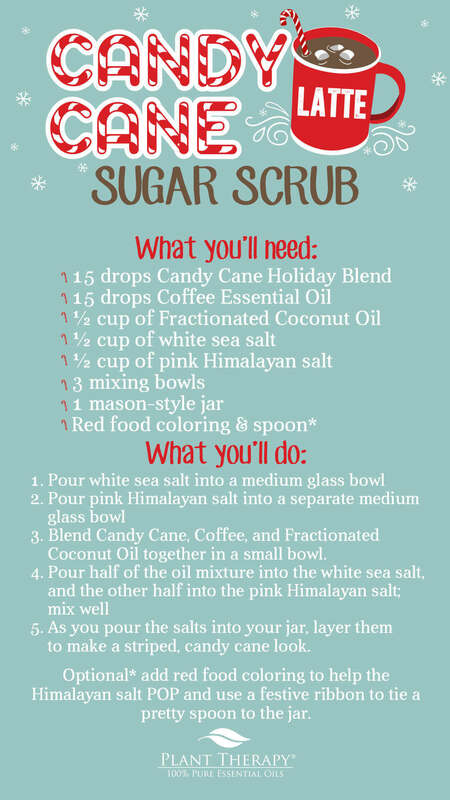 They have a blog post from 2015 that has a candy cane scrub recipe. Seems very similar just without the coffee 🙂 I made it for my family that year and everyone loved it! This sounds amazing! Great idea! Love this. I think I will make a few of these for gifts this year! Can’t wait to try this for Christmas gifts! This sounds delightful! I think my mom would love it as a gift. This will be a great take away gift for my cookie party. Thank You Plant Therapy!! Looks like a great recipe but why is it called a sugar scrub and not a salt scrub? Sugar scrubs are made with sugar, this is made with salt. This sounds so fun- especially layering the colors! Coffee EO also needs to go on my wish list. Thanks for the recipe. I didn’t know coffee EO was a thing…exciting! I want to try this. This looks amazing. Something I would try. would you use this as a body scrub? Also do you add sugar to it or just the salt? This sounds amazing! Definitely adding this to the list to DIYs to try! This sounds wonderful! Will definitely be making this for holidays! Love it! This would make a great gift! Wow this is amazing ❤️ Thank you. I look forward to using this. Thank you for this recipe! This is perfect for teacher gifts.